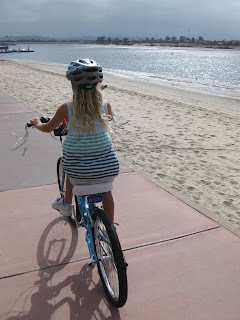 This was more of a mini field trip, we decided, on a whim, to head on down to San Diego's Mission Bay to do a little exploration via bicycle. 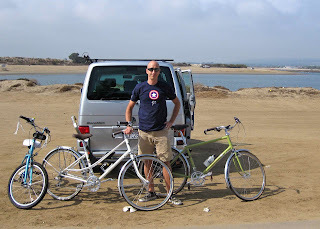 So I threw the Electras on the van, gathered the helmets and drove all of 25 minutes or so to one of San Diego's favorite recreation areas. 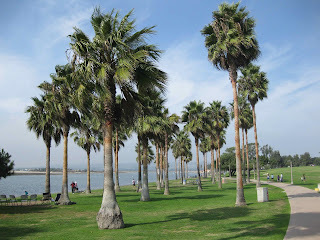 Built in the 1940s-60s as an aquatic playground, the park is popular with boaters, jet skiiers, kayakers, sailors, fisherman and general picnic day usage. 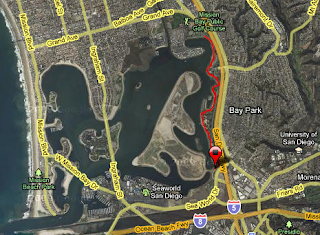 There's also a network of multi-use paths that follow most of the shoreline. 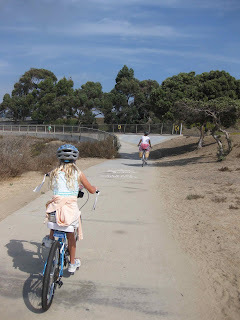 And with it being flat, a good place for Celeste to get some mileage in without having to endure the hills here in North County, nor the traffic of Coast Highway. Picnickers were out full force, most shelters were occupied and, with the boats zinging around the bay and green foliage, it was easy to forget that it's mid-October. We still can't believe we live in a place with palm trees. 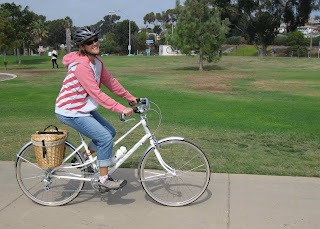 Celeste had to bring all of her clip-on handlebar flowers - always gotta make the bike look pretty. 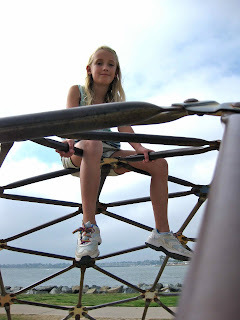 Of course it's nearly impossible for Celeste to pass a playground without stopping to get the urge to climb out of her system. 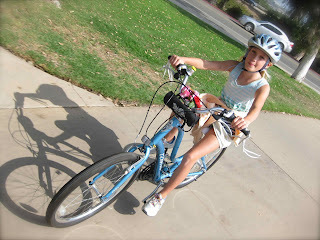 Allie's been loving riding one of the ladies' Electra Ticino samples from the office. It's going to be hard to pry that bike from her hands. ...but it was a great way to spend time with the grrrls on a nice October afternoon. We'll get back there soon, maybe bringing the kayaks or renting a boat.